Arthur "Bull" Simons was born on June 28, 1918, in New York City, New York. He was commissioned a 2d Lt of Artillery through the Army ROTC program at the University of Missouri on June 10, 1941, and went on active duty beginning September 2, 1941. After completing the Field Artillery Officer Basic Course, Lt Simons served as a Platoon Leader and Battery Commander with the 98th Field Artillery Battalion at Fort Lewis, Washington, and Camp Carson, Colorado, from December 1941 to December 1942, and then deployed to the Pacific Theater from December 1942 to August 1944. His next assignment was as Executive Officer of the 98th Field Artillery Battalion and then of the 6th Ranger Infantry Battalion in the Pacific from August to October 1944, followed by service as Commander of Company B, 6th Ranger Battalion, from October 1944 to February 1945. During this time, Capt Simons participated in combat operations during the Invasion of the Philippines, and also in the Cabanatuan Raid that rescued over 500 Prisoners of War who were survivors of the Bataan Death March. He served as Executive Officer of the 6th Ranger Battalion in the Philippines and on Occupation Duty in Japan from February 1945 to January 1946, and then left active duty and joined the Army Reserve on May 16, 1946. Maj Simons returned to active duty on June 26, 1951, and served as a Ranger Instructor with the Ranger Department of the U.S. Army Infantry School at Fort Benning, Georgia, from June 1951 to September 1954. His next assignment was as a Tactics Instructor and Infantry Advisor with the Joint American Military Mission for Aid to Turkey from October 1954 to June 1957, followed by service as Information Officer with Headquarters XVIII Airborne Corps at Fort Bragg, North Carolina, from July 1957 to October 1958. 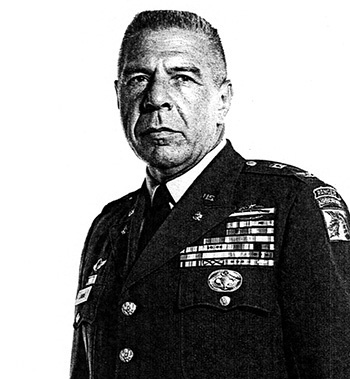 LTC Simons served as Assistant Executive Officer for the 77th Special Forces Group at Fort Bragg from October to November 1958, and then as Commanding Officer of Detachments FC-2, FC-3, and FC-4 with the 77th Special Forces Group from November 1958 to August 1960. During this time, he participated in Operation White Star in Laos from July 1959 to May 1960. His next assignment was as Executive Officer of the 7th Special Forces Group at Fort Bragg from August 1960 to January 1961, followed by service as Commanding Officer of Company D, 7th Special Forces Group from January to April 1961. Col Simons served as Deputy for Plans and Training with the U.S. Army Special Warfare Center at Fort Bragg from April to September 1961, and then as Commanding Officer of Detachment C-1 with Company A, 7th Special Forces Group, and then as a Liaison Officer with 7th Special Forces Group, from September 1961 to June 1962. During this time he deployed to Laos from October 1961 to June 1962. His next assignment was as Chief of Staff of the U.S. Army Special Warfare Center at Fort Bragg from June 1962 to January 1963, followed by service as Commanding Officer of 8th Special Forces Group at Fort Gulick, Panama Canal Zone, from January 1963 to July 1965. Col Simons served with the Studies and Observation Group in South Vietnam from September 1965 to September 1966, and then served as Assistant Chief of Staff for Civil and Military Co-operation and Assistant Chief of Staff for Personnel with Headquarters XVIII Airborne Corps at Fort Bragg from October 1966 to September 1968. His next assignment was as Deputy Chief of Staff for I Corps with U.S. Army Korea in South Korea from January to December 1969, followed by service as Assistant Chief of Staff for Logistics with Headquarters XVIII Airborne Corps at Fort Bragg from December 1969 until his retirement from the U.S. Army on August 1, 1971. During this time, Col Simons served as Deputy Commander of the Joint Contingency Task Group, Operation Ivory Coast, and as the backup ground commander during the Son Tay Raid, a clandestine mission to rescue American Prisoners of War in North Vietnam on November 21, 1970. After his retirement from the Army, Simons was hired by Ross Perot to lead a rescue team into Iran in February 1979 to rescue employees of his company (EDS) during the Iranian Revolution. He died of heart complications three months after the rescue, on May 21, 1979, and was buried at Barrancas National Cemetery on NAS Pensacola, Florida. The Col Arthur D. Simons Center for the Study of Interagency Cooperation supports the U.S. Army Command and General Staff College and was named in his honor in 2010. Colonel Arthur D. Simons, Infantry, distinguished himself by extraordinary heroism while commanding the ground element of a Joint United States Task Force on an operation deep in North Vietnam on 21 November 1970. With complete disregard for his own personal safety, Colonel Simons voluntarily participated as a member of a Joint Task Force with the humanitarian mission of rescuing United States military personnel held as prisoners of war at the Son Tay Prison Compound approximately twenty nautical miles from Hanoi, the capital of North Vietnam. In an outstanding display of leadership and personal courage, Colonel Simons led the helo-borne force in the rescue effort. On the ground, the search and rescue element was immediately taken under automatic weapons fire by the enemy. While directing and supervising the operation, Colonel Simons continually exposed himself to enemy fire, and on one occasion, personally took under fire enemy personnel in close proximity to his position. The success of the operation was the direct result of Colonel Simons' calm and competent leadership in an outstanding operation. Colonel Simons' extraordinary heroism was in keeping with the highest traditions of the United States Army and reflects great credit on him and the United States Army.